Challenge Prompt: Celebrate! You've made it this far, and the next challenge is to hold a party for your friends and family (at least four guests, you can include yourself in the 4 person count). Whether you're an experienced host or an entertaining newbie, get creative and host a luxurious dinner party where your guests will discover new tastes and exotic flavors. I'm gonna be honest with you. I was scared about this challenge in particular. Shakin' in mah boots. When you I think "dinner party", I think money. Not something in surplus these days. Heck, it's not something I'm even feeling comfortable with. Hence, the knee-knockin', shiver-inducing, mind-numbing jitters that I felt even contemplating this challenge. I mean, dinner party to me actually means luxury...not a word I entertain often. So, with my initial freak-out out of the way, I offer you the best advice I have to give you when it comes to planning a party of any sort... Just Breathe! Yes, deep breaths. Clear the clutter, the unobtainable dreams, and any dread from your mind and sit down...with a fresh mind and a blank notebook. Brainstorm. Jot down your thoughts...do you have a theme...idea...goal...challenge? Important thing number two... Lists! I cannot survive without my lists. Once I think I have an idea, I form separate lists for Food (shopping and timelines), Decorations, Guests, Recipes, Inspiration, etc! Also...work with YOUR ...Budget. The one you actually have...not the one you wish you had. Once you've made your lists...and whittled them down to fit your budget...and have continued to breathe through it...start executing! 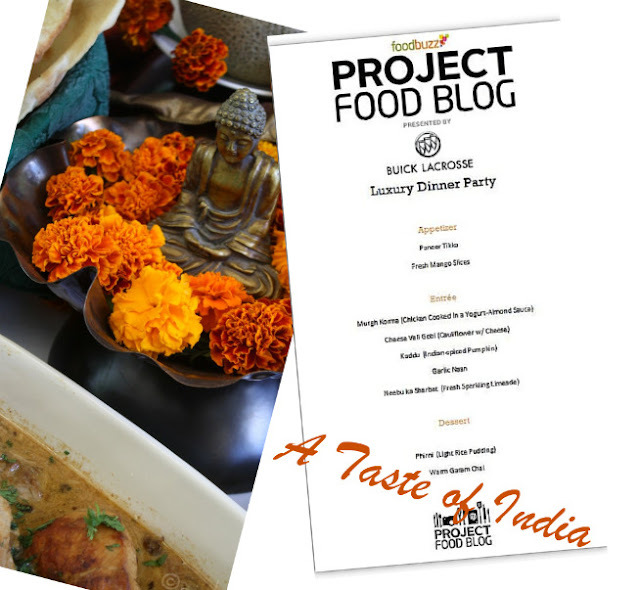 I decided I wanted to have a dinner party with the Tastes of India! I realize that India is large and diverse and that this would only be a sampling...an introduction, if you will. But the flavors were fresh, bold, and exotic to everybody who would be attending the party...so it was the perfect choice for me! Would you believe it if I told you that I threw a Luxury Dinner Party for SEVEN guests for just SEVENTY dollars? Well, it's true. I let go of the things that were stressing me...and opened my eyes! If you're working on a budget, I suggest that you take stock of the things that you already own...and the things your friends, family, and neighbors already own! Afterall, a dinner party should be about good food, good company, and the atmosphere that comes from the combination...and worrying about serving dishes, plates, glasses, and decorations detracts from that. All of the money I spent, I spent on food. The decorations, dishes, bowls, utensils, etc...all came from my own stock or that of my family. When I invited them, I also asked if they could scour their kitchens/pantries/storage areas for anything that was warm and earthy and could be paired with other things to look "Indian-y". I also chose a menu which I could execute a day in advance. Food that would hold up to a final re-heating just before party time...that way I would be free to join my guests and not be stuck in the kitchen. 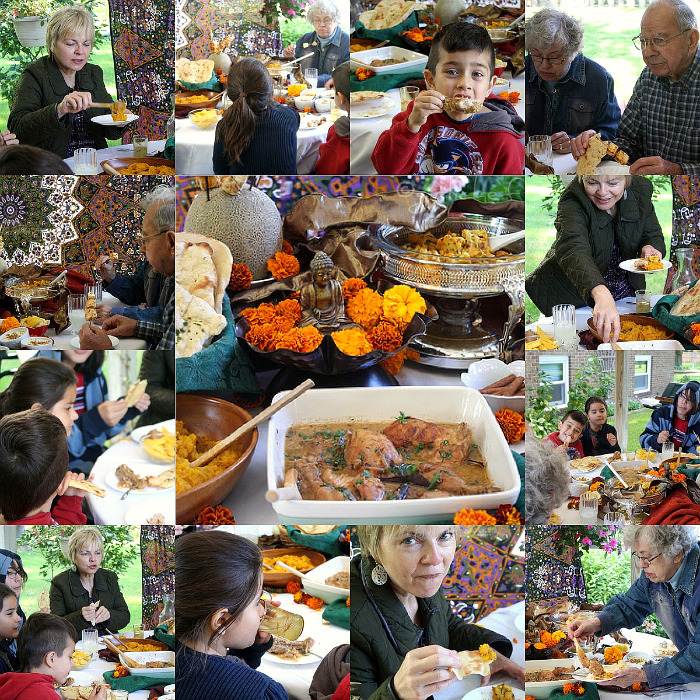 Paired with a beautiful if a little chilly with gale-force winds... late day time slot...I had the perfect setting for introducing four generations of my family to some of the tastes of India! Great food. Great company. Great conversation between the oooohing and aaaaahing and marveling over the fabulous, warming, mesmerizing flavor combinations! My biggest advice to you when throwing a Luxury Dinner Party on a budget...RELAX and ENJOY YOURSELF...and then your guests will, too. Well done! The meal looks fabulous! Indian food is the one area that I am trying to get better at. It looks like you have linked some wonderful recipes. I tried your warm garam chai recipe last night and loved it. Although I probably shouldn't have drank it so late, I was up until 3am this morning on excess caffeine. Your tablescape looks great and your tips are quite good - especially working with your real budget. Good luck in moving on. Heather, you did a fabulous job! 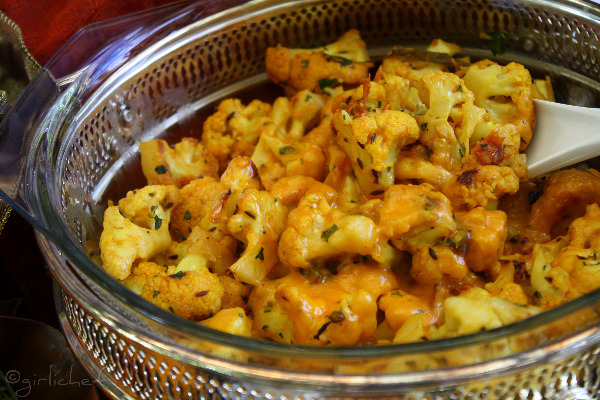 I love Indian food and wish I could have come to your dinner party. I can't wait until all the recipes are posted. Beautiful!! The look on the faces of your guests says it all. This looks marvelous, well done. I am sure you are going to do well with this. I cannot wait for the actual recipes. wow. That looks awesome. Good for you keeping things in budget too. I initially thought you were going to make the meal vegetarian to keep the price down, but you also managed to get in chicken, paneer and pistachios (I guess I'll find out later if the paneer was from scratch). Wow, girli! What a great meal and your guests look so happy (well fed also). Proud of you and you'll get a vote from me. You nailed this one and did so on a limited budget. That is a great twist from some of the other entries I have seen. What a gorgeous dinner party! I adore Indian food - my mother hosted a holiday party for 20 years featuring curries all from scratch. It's so celebratory. I am impressed that you kept it within a budget while delivering all those fabulous courses. I'll be back with a vote tomorrow. And look forward to the recipes. Oh how lovely! I kind of freaked out when I thought about the price of a large dinner party as well, which is why I kept mine minimal and used a lot of things that I already had on hand! The idea of doing an Indian theme sounds just perfect! And all the food looks great. I can't wait to see the recipes. You've always got my vote chica! Fantastic.... Its a great treat... Looks fab.. Am sure you guys enjoyed it.. Your presentation is wonderful.. Garlic Naan, Phirni, paneer tikka, gobi.. wowww.. so tempting.. great work..
Everything looks beautiful, Heather! 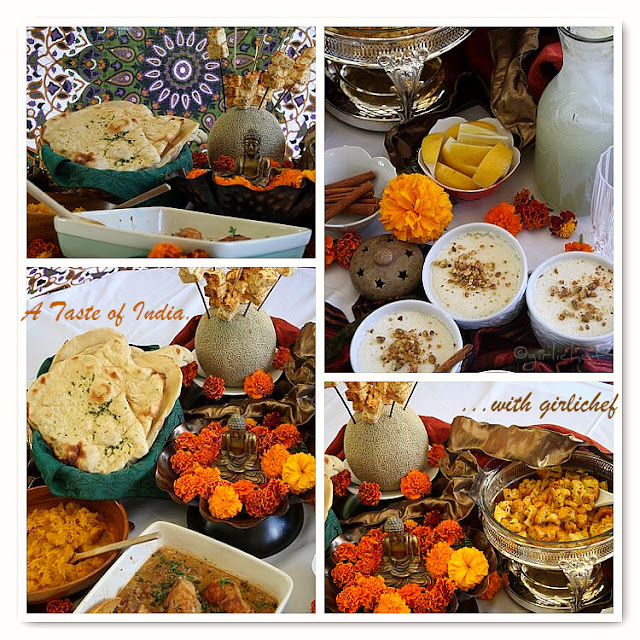 What a gorgeous feast for your family and a great way to introduce Indian cuisine. I loved all the pics. I think this post will strike a chord with many people, including myself, who also have limited resources but want to make the most of what they have. Your creativity and approach are what made this challenge so special. Think of how differently things would've turned out had you had an endless budget. In the end, it takes way more talent to put together a beautiful meal like this that reflects your warm and down to earth personality than to hand someone a few $100 dollar bills for luxury items. This is a meal that you should definitely feel proud about!! WOW! Look at that array of foods...! You have done a fantastic job! Good luck in the 3rd round :)! Heather this is absolutely fantastic! FANtastic. I'm a big dinner party thrower and you wouldn't believe the notes/journals/planning that I do in advance. I even send out invitations that includes a menu a few days in advance. I think it's fun. One of these days I'm going to blog about it. Your menu looks mouth watering! You know I'll be heading over to vote for my Bayless Buddy! Heather..what can I say..the least I can say is that I am totally impressed..Looks like a spread made by a seasoned Indian chef!! Heather, I am hugely impressed. I mean - wow! I knew you were talented, but I had no idea. Amazing! I will be voting for you in the next round too BBFF. This is a winner. So much thought, effort and love are behind this menu. very beautifully done table.You have the perfect dishes and the authentic way of doing it.The way you have done the indian dishes shows thatt you are already a winner! i love the marigolds - you picked a great theme and you budgeted like a champion - good luck! rock on with the budget as well! What a feast! 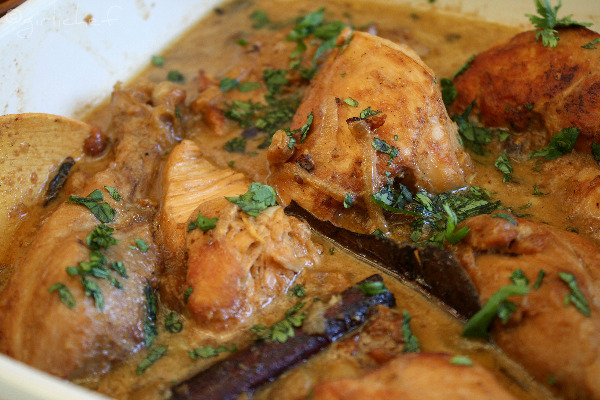 Flavors look delectable...Indian food is simply...good. A beautiful meal in a beautiful place setting! Will vote for you! WOW! what a fantastic dinner!!! Everything looks incredible! I so love all the pictures! You'll my vote! I love how you've been challenging yourself with dishes from various countries. You did a great job here once again!!! You've got my vote! What a grande party, I am really loving it. What an amazing feast. 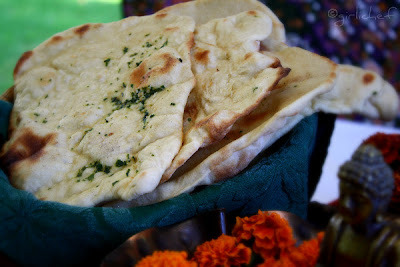 I adore Indian food, and I would have loved to attend such a well-thought, creative party! Your dishes looked delicious from first to last. You will receive a vote from me tomorrow, no questions about it! Now if only I could try some of that Indian spice pumpkin...wow that looks good! Indian food is so tasty and this looks fabulous...well done! Mmm, what a fabulous spread, I've been all about Indian food lately so it's all right up my alley! Yay! Congrats on advancing to the third round!!! I can't believe you pulled off this spread for $70. Simply amazing. simply gorgeous. i have cooked in india...and this does that amazing cuisine justice. great choice and it looks like a lovely party. congrats on making it one step closer. my fingers are crossed for you! Having a luxury party outdoors is a perfect way to make it special. It looks like a great party, which wonderful friends and fabulous food. Oh no! My invite must have been lost in the mail! ;-) What a perfect PFB entry and a wonderful party. It all looks amazing and how great that you did it on a budget. Congrats! 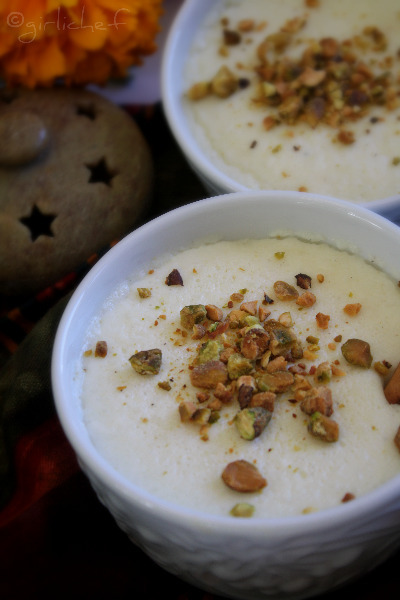 The phirni looks really nice & creamy. I am yet to perfect it... just cannot make it the way my mom makes it. Loved the budget part! The setup looks spectacular and the food divine! I want a seat at this table! Great job Heather!!! Beautiful setting...Love the dishes and looks like a fantastic party :) Voted! Wow, that all looks SO delicious. And beautifully presented. Wow, this is amazing! I would totally want to come to this party!! You've definitely got my vote!! 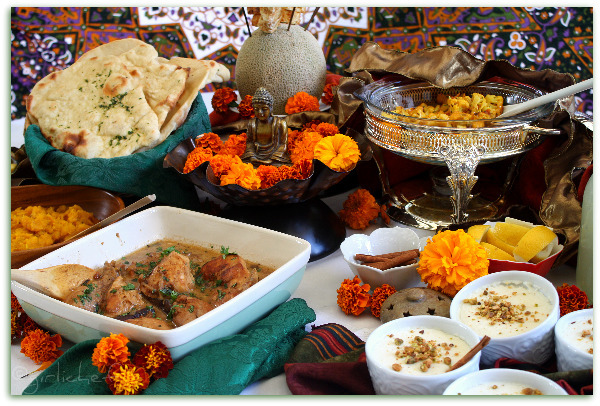 Heather, your Indian feast looks amazing - I love Indian food and I so wish I could be there. Goes without saying that it gets my vote. I love that you did this on a budget! Amazing! I tried my best, but still went over $100 for 6 people -- you win! Your dinner looks lovely Heather! So warm and inviting. Good luck with this round! A beautiful decor and a great variety in food choices! Brava! But, I did not expect anything less from you! All for only $70.00? That was a real challenge. I loved the blue and gold drapery seen in some of the photos. 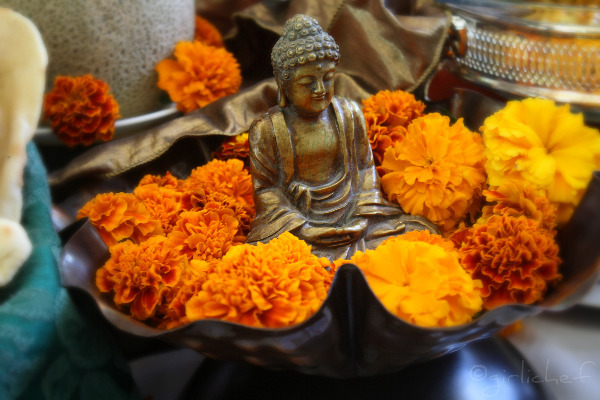 And Buddha seems so happy surrounded by his favorite color! Good luck! I gave you my vote, of course, first thing this morning! I love this whole indian theme everything sounds delicious. I love that everyone brought Indian style accoutrements! A lovely meal. Indian food is a family favourite. This looks stunning!! You've got a vote from me! What a gorgeous setting--the color and presentation makes the food look so inviting. And def agree about the budget. Big believer in taking what you own and what your friends own, and then spending the money on food! Everything looks marvelous! I wish I could of joined you all! I love Indian foods and will be trying your recipes soon! I'm off to vote! These dishes look masterful! How I would've loved to have pulled up a seat at the table to enjoy this feast. I see you're starting to post the recipes - I am so going to bookmark all of them! 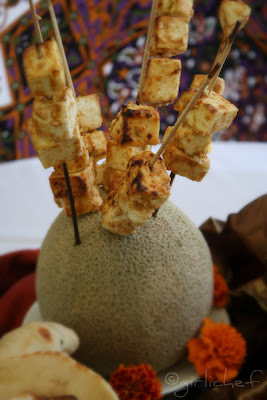 Congratulations on this entry and your continued success in Project Food Blog. Just voted! Fantastic tablescape and your menu looks delicious! Good luck in round 3! Beautiful presentation! And the food looks even more delicious than it sounds. And most importantly it looks like everyone had a great time. Nicely done. I voted! I love your presentation very much, you have captured the Indian-y atmostphere perfectly! $70? $70?!? You are a magic chef!!! 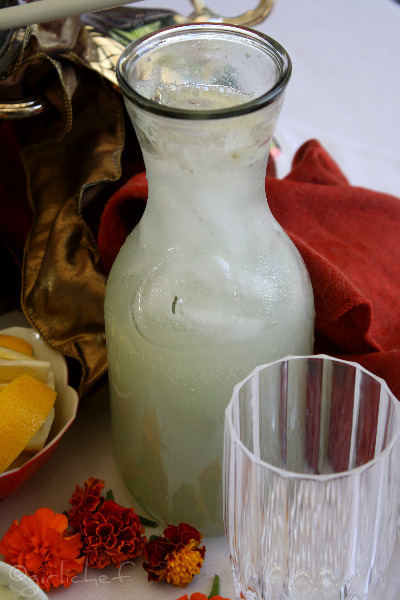 I love your Taste of India dinner theme, so exotic and tantalizing! You deserve to go to the 4th round! Oh My! This was a delicious dinner! The pictures are tempting, the dishes are so irresistible, waow! best of luck for the round! those entrees look super yumm and how can i not love that beautiful presentation that too in an indian theme. bravo and good luck! voted! Looks delicious! 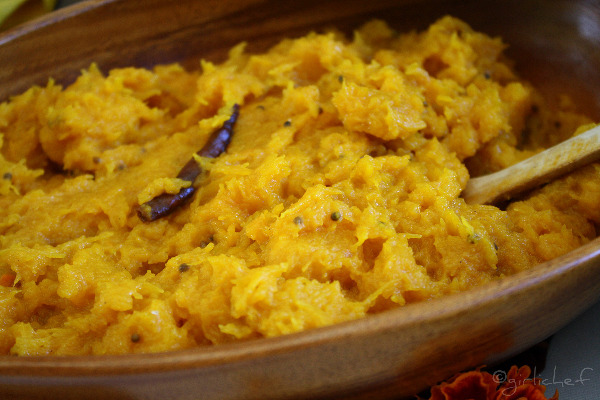 I'm not a huge fan of Indian, but I *want* that spiced pumpkin dish. Got my vote! What a beautiful table. Your menu looks wonderful and of course I have to bookmark all the recipes. Good luck on your FB challenge. Way to make me hungry! Actually, that's a good thing ;) Next time, just remember to invite me too hehe. The food all looks delicious, and I love love how everyone is having a good time! That's the most important part!!! You've got my vote! I'm glad you were able to work with your budget and make such a delicious and beautiful spread. Wonderful job! Great job, Heather! Every dish looks wonderful and the ensemble is perfect. Here's my vote and Good luck! Heather, I am so pleased you are moving to the next challenge... the next one should be right up your alley... Of course, I will continue to back you... Best of luck! WOW!! what a luscious spread! !